maintains traditions dating back thousands of years. There is plenty to discover in this age-old city and the ancient fortresses of the Kyzyl-Kum desert. As a centre for slave caravans it was an intimidating place and a by-word for exhausting desert journeys. Today it’s a welcoming ‘museum city’, where 3,000 residents keep alive the charm of ancient traditions”. , with its colours of sable and ochre and brickwork walls dominates this ancient city, which lies south of the Amu Darya River. 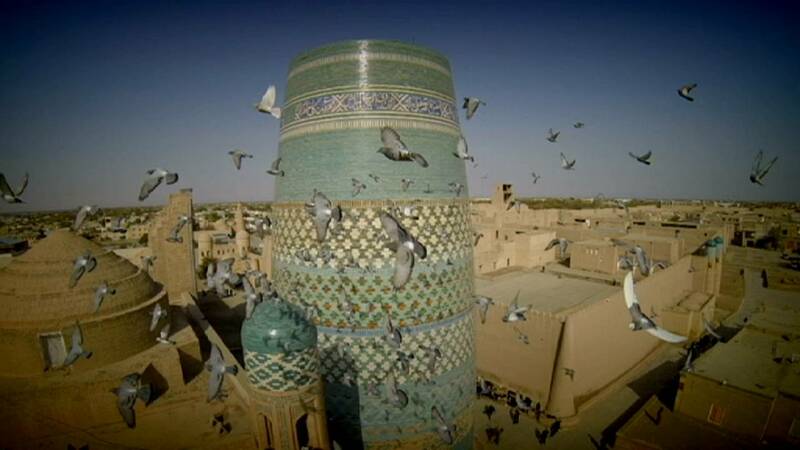 Khiva was once an oasis, the last stop-over for caravans before crossing the desert to Iran. It is a city steeped in tradition, with an age-old way of life maintained by the locals. Even bread-making has roots in the ancient religion of Zoroastrianism. “The tradition of making bread has been passed from from generation to generation,” said local resident Zaynab Abdullaeva. “We teach our girls how to make bread because it’s our national tradition. My mother taught me how to do it and my grandma taught my mum” . In Khiva families use outdoor clay ovens to bake their bread. Some of them are set in one of the main squares of the inner city. Historian Khudayberganov Kamiljan says bread is much more than just food: “Bread is everything for Uzbek people. In the Zoroastrian book Avesta it’s said that bread is sacred, and it can make you strong and healthy. In our tradition it has been like a main course for a long time”. The link between bread and Zoroastranism can be found in the shapes formed in the dough. “The patterns you can see on the bread symbolises the sun, which was worshipped in Zoroastrian times. It was a symbol of peace, good will, happiness and respect, and you can find the same patterns on religious buildings,” said Khudayberganov Kamiljan, . Zoroastrian influences are evident on the facades of Khiva’s buildings. Even mosques and madrassas carry the symbols of different religions, revealing how the cities of the Silk Road were crossroads of philosophies, faiths and cultures. “There has always been a strong link between the people of the desert and Khiva’s residents,” adds the local historian Khudayberganov. “There was an intensive trade in merchandise. Nomads brought milk, meat and other goods. The residents of Khiva exchanged those products for bread and other things that couldn’t be made in the desert”. After a two-hour drive from Khiva it’s easy to lose your bearings in the arid steppes of the Khorezm region. It is considered the cradle of one of the great civilizations of central Asia. The ruins of many Khorezmian towns and palaces have been found here. Among the most spectacular is Ayaz-Qala, a complex of three forts, and Toprak Qala, which we visited with one of the first archaeologists to work on the site. “Research was done here over many years,” Vadim Yagodin told us. “It started before the Second World War, in 1938-1939, and went on after the war. “According to a current scientific theory, these huge ruins in ancient times were a residence of the Khoresm kings during the 3rd century A.D.”. Today it is possible to explore some 20 mud-wall forts in what is known as the ‘region of 50 fortresses’, but that number is only an estimate; there could be more. In this series we heve unveiled the secrets of Samarkand, we’ve taken you to the markets of Bukhara and shown you the traditions of Khiva. Our adventure along the ancient Silk Road has come to an end in the Kyzyl-Kum desert.